Mon., Feb. 8, 2016, 10:40 p.m. The pitch-perfect timing and delivery of Marshawn Lynch’s retirement – fourth quarter of the Super Bowl, via Twitter, visual suggestion only – was another chasmal moment for the National Football League, which is being hit hard from all sides these days. Just in time, however, Cam Newton arrived at the post-game interview podium to fill the gaping void for the People Needing to Feel Aggrieved About Something That Doesn’t Matter. Cam didn’t mention anything about being there only so he wouldn’t get fined, but his sullen demeanor nonetheless sent America into Hot Take Heaven for a full news cycle. Even the athletic director at Washington State got into the spirit on his radio show, decrying such bad manners. Apparently, Bill Moos’ standards have stiffened since the New Mexico Bowl a few years ago. If Lynch caught a replay of Cam’s act and the reaction – and he’d have had to hire a Sherpa to get him to where he could avoid it – surely it was driven home that too many will never stop obsessing over this nonsense, and made it a final affirmation that it’s time to go. What led him to the decision, though, could well have been the realization that time has its own Beast Mode. Lynch’s days with the Seattle Seahawks pretty clearly had come to an end, with a replacement already auditioned. His usefulness and durability as an NFL running back were in question. His own armor had been dented by a season of injury and even vulnerability. Finding another club to pay him a comparable wage and indulge his Marshawn-ness was problematic, at best. And so we were treated to a Tweeted picture of a pair of football cleats a-hanging – weren’t those the gold ones the NFL banned? – and a peace emoji. We are not likely to get amplification. What, really, do we need? Lynch is, as he once said, “all about that action, boss,” and this was the final one. No more Beast Quakes, no more four yards of sheer will, no more road rage in shoulder pads. Chopping up the relative worth of Seattle’s sports icons has always made for an amusing parlor game. Was it Gus Williams’ flash that made the championship Sonics go, or John Johnson’s old-pro wiles – and even then, didn’t the fans love Downtown Freddie Brown the most? Ken Griffey Jr. made baseball cool and relevant in Seattle, but Randy Johnson hoisted the club on his back in that franchise-saving year – and, even then, didn’t everyone love Edgar Martinez the most? And the championship-era Seahawks? Well, the magic didn’t happen until Russell Wilson brought new-era quarterbacking, and of course the brutal ethic of a Kam Chancellor set the tone for a defense of dominant personalities. But it was never close: the 12s drew their oxygen from Marshawn Lynch. Even his average runs triggered anticipatory roars, the balled-up violence and otherworldly balance inviting all sorts of possibilities. He arrived before almost all the other current Seahawks stars and indeed was the foundation of Pete Carroll’s vision. 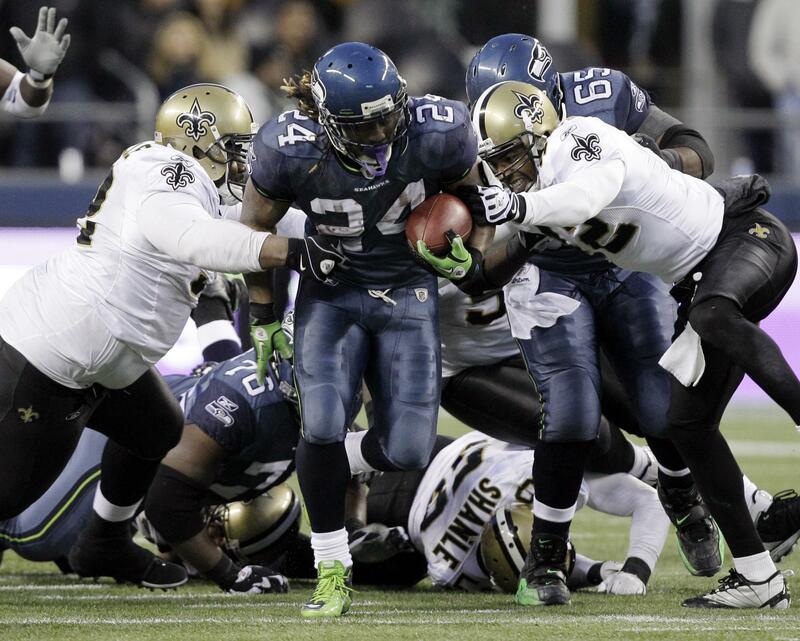 He needed Wilson and the defense to make the explosion, but Lynch was there first to light the fuse. It’s hard to imagine another back who could make it work behind Seattle offensive lines that were often ordinary at best. And the testimonials from Seahawks players suggest a teammate universally loved, if not always understood. How they – and Carroll – felt about him taking an incommunicado rehab from hernia surgery out of town the second half of the season was never really addressed, nor was his last-second decision to skip the playoff trip to Minnesota after practicing all week. If nothing else, it all seemed like a connection fraying, which made Lynch’s decision no great surprise. As for his recalcitrance with the media, well, those confrontations only served to drain more dignity from a profession that can’t afford the runoff – Lynch won every time. And Seahawks fans even roared their approval at that, though it says more about the brain freeze of fandom than anything else. Some of these same dipsticks recently worked up a petition to ban Newton from playing in our state owing to his unsportsmanlike ways. But Beast Mode’s crotch-grab touchdown leaps? Keep ’em comin’! There are few absolutes of character, as Peyton Manning reminded us when he interrupted his finest moment to shill for Budweiser. Lynch had one: he played football with an unsparing drive, a purity. When he no longer could – and maybe when the fools were no longer worth suffering – he sent in his retirement postcard. Now will come the arguments over Hall of Fame worthiness, among other things. An eerie statistical match with Earl Campbell would seem to be the only evidence necessary, but of course there is more to the vote than that – though at least the NFL stewards have not been reticent about accepting a few greats with social legacies in need of buffing. And then there’s the induction speech. He would seem to owe us that. Published: Feb. 8, 2016, 10:40 p.m.